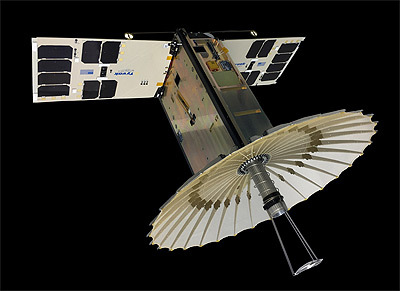 RainCube (Radar In a CubeSat) is a technology validation mission by NASA's Jet Propulsion Laboratory to demonstrate the operation and performance of a miniaturized Ka-band Atmospheric Radar for CubeSats (miniKaAR-C) in the space environment on a low-cost, quick-turnaround platform. RainCube would develop, launch, and operate a 35.75 GHz radar payload on a 6U CubeSat. This mission will validate a new architecture for Ka-band radars and an ultra-compact deployable Ka-band antenna in a space environment. RainCube would also demonstrate the feasibility of a radar payload on a CubeSat platform. This new instrument will enable constellation missions and potentially transform climate science and weather forecasting. It was selected in 2016 by NASA's CubeSat Launch Initiative (CSLI) program to be launched as part of the ELaNa program. It was launched on board of Cygnus CRS-9 to the ISS, where it was deployed on 13 July 2018 via the JEM airlock.